Alicia Hendley who writes with a passion and insight blending her background as a psychologist with her personal experience as a parent has written a book that is an invaluable resource for all parents of children with Autism Spectrum Disorder. DUNDAS, Ontario - April 4, 2016 - PRLog -- The above is a paraphrase from a five star review on Amazon of Dr Hendly's book When Autism Comes to Roost: A Family's Journey From Denial to Acceptance. That review goes on to say that the book is "An invaluable resource for anyone who knows or loves someone on the spectrum and a great read in its own right. Highly recommended." Dr Hendley is the mother of four children and her 3rd child, Max, was diagnosed with Autism. At that time, she was a counselor for university students helping them deal with their own mental health issues while trying to deal with this new and troubling diagnosis and her own developing mental health problems. The book is divided up into 8 sections that start at the beginning of the diagnostic journey with Denial and end with Acceptance. In a review of the book by Jo Worgan on Autism Daily Newscast, Ms Worgan says that "There was just so much that I enjoyed and gained from reading this book." "I found the lists that she makes, detailing what Max's autism means, hugely insightful." "I also liked the section that was devoted to Anger." "The fact that the autism diagnosis is also just the start of the journey, not the end, is also an important point that is made"
"Finally, I was very grateful that Alicia touched upon feelings of guilt, which are very rarely shared. The guilt of not knowing sooner that something was wrong - the 'what if's' such as 'what if' we had acted sooner? That even though there is no point in looking back, we still do. We still feel the guilt, and this is very hard to admit to." "Anyone who is affected by autism but especially parents. Sometimes you can feel so alone and isolated, and I found that by reading this book, I had a friend. I understood exactly what this author was feeling. If you are a mother to a child with autism, then this book will speak directly to you. If you are new to the world of parenting a child with autism, then this book will show you that you are not alone and that everything you are feeling is okay." Another five star review from Amazon said "poignant, revealing, funny, sad, ultimately uplifting--a terrific memoir from a mother's heart." These two reviews were on Amazon Canada. When Autism Comes to Roost was featured in the October issue of Autism Parenting Magazine (Issue 40) and was described as a book that "will appeal to any family faced with an emerging physical or mental disability in a child." 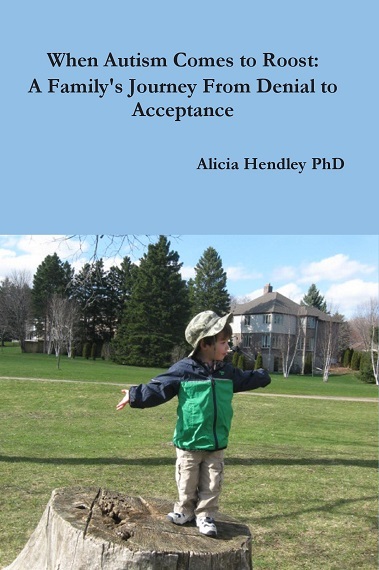 When Autism Comes to Roost: A Family's Journal From Denial to Acceptance by Dr Alicia Hendley ISBN 978-1927637234, $19.95, is distributed by Ingram and available at all retailers worldwide in both print and all e-book formats.